Saturday at the Tobacco Hut found me smoking Maltese Falcon in an Ascorti Pepino. The combination was especially nice; I'm fairly new to Greg Pease's blend (still working on my first tin) and it is a bit drier now than when I first opened it. The smoke was cool and flavorful and I had no problems keeping it lit. The day was a little strange, although certainly not for the same reasons as last Saturday, but will get to that in a bit. The eternally cheerful Joe K arrived shortly after I did, and we promptly began talking tech, probably to Lou's dismay. Joe gave us each a business card that his wife Val had printed up for him - he does a lot of computer work (repairs, training, etc.) for friends and neighbors and they always ask if he has a card, so now he does. It's a fine looking card and I wouldn't change a thing on it - well maybe just a little (inside joke for Joe & Val)! Peter arrived and was greeted, as usual, with a Cheers-like "Peter! ", a la Norm. He announced a new business venture and the four of us brainstormed a bit offering names, logo ideas, slogans, etc. I offered to work on his marketing materials and graphics (or, as Joe says, "fancy stuff"), and I started last night, sending Peter four logo ideas. Barry came in a short while later and we ended up having a most interesting, and different conversation. As I alluded to above, it was almost strange because the topic between Barry, Peter, Lou and myself (Joe had left by that point to take a nap. He claimed he was going to Home Depot, but we know better. He's retired - we're all jealous) was something that rarely gets discussed at the Hut: religion. And, moreover, it was quite civil. 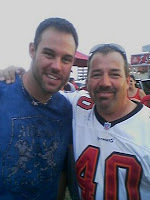 Speaking of Barry, a few weeks ago he sent Peter a picture of himself with Tampa Bay Buccaneers player Mike Alstott. Peter immediately called Barry out for two-timing on his beloved Dallas Cowboys by wearing a Bucs jersey. The rub was that Barry sent the picture to Peter from his wife's cellphone, and that's where Peter responded. Barry's wife got the text and, of course, had no idea what was going on. The picture appears below, for all the world to see. Barry recounted another story, this time about meeting New York Yankees great Derek Jeter. He and his wife were in Macaroni Grill in Tampa when Derek Jeter walked in with a group of a dozen or so other people. Barry could hardly contain himself but when his wife urged him to approach Derek and ask for an autograph, Barry begged off, saying he didn't want to interrupt the man's dinner. When Derek's party was leaving, Derek headed off to use the men's room...and since Barry wasn't doing anything about meeting his favorite player, Lori sprang into action. She followed Derek Jeter into the men's room and explained that her husband's favorite sport was baseball, his favorite team was the Yankees, and he was his favorite player, and could he please have his picture taken with Barry. Derek, more than a little surprised, said he would if he could be allowed to finish peeing. The result is seen here, taken just inside the restaurant, not the men's room.